Luxuriously rich in character, this warming winter ale delivers over 10% alcohol in an oh-so-seductive manner. Deliciously fruity flavors lie under a bracing hop nose. This is another later winter early spring left over. 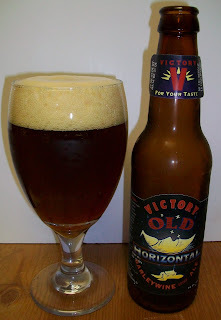 It has been a chilly rainy April day here and I knew since lunchtime today that this was the perfect beer to review tonight; a big beer barleywine to take the chill off. 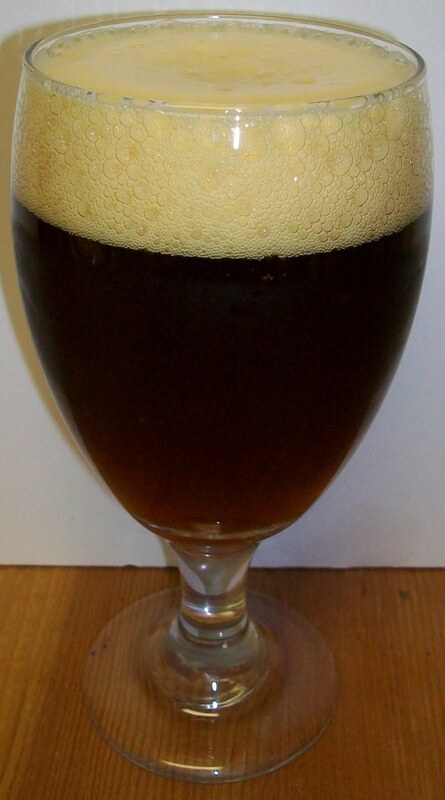 The beer pours a nice amber color with orange hues and a fairly rich off white head. This beer is also highly carbonated with lots of tiny bubbles rising up from the bottom of the glass. Rich toasted malts and hop aromas on the nose along with sweet alcohol notes. We are starting this one out at 49 degrees. Ahhh, the perfect beer for a chilly rainy night. This is a straight up classic barleywine style ale. The taste starts with sweet toasted malts upfront on the tip of the tongue. Then toward mid-sip you start to realize that this is no lightweight. There is a building hop and malt bitterness, well, it’s more like a heartiness throughout the middle of the sip. The back-end continues this feeling with nice earthy and hoppy flavors. The finish is quite dry with a distinct hop bitterness and alcohol; neither is overpowering just a classic barleywine finish. The final aftertaste is that unmistakable barleywine ending. It’s almost like an imperial/double IPA but less better and drier. I don’t know what that is but it is very distinctive to this style of ale. It’s not a refreshing finish but a most satisfying one. This beer also has a very nice warming effect. Again, this is a perfect beer on a chilly spring evening to sit down with after a long day at work. This beer also had some sediment floating around the glass. I did not read whether this was bottle conditioned or not so I just poured the entire bottle into a cervoise glass. It could just be partially filtered, I’ll have to look that up later. This is not an easy drinking beer; don’t miss-understand me it’s not suppose to be. It is not one of those beers that you are going to slam down and open another. At 11% ABV this is more of a sipping beer, well, at least it’s not a guzzler. Now at 58 degrees the rich malts are making themselves more known. Did you miss me? Sorry I took a break from the review to eat dinner. Actually I miscalculated how much time I would have before dinner and thought I could get a review in. But I ended up missing dinner with the family and thought I would grab something before the kids cleared the table. Dinner was boneless pork tenderloin chops baked with apples and served with buttered egg noodles. This was actually a half decent pairing. The rich malts and hops in the beer cut through and it’s a nice contrasting pairing to the sweet apples and pork. The beer was a little strong for the meal but the contrasting flavors make for an interesting pairing. The real bottom line is that I need to stop for a “Dog House Special” for reviewing beers when I should be eating dinner with the family. Oh, the “Dog House Specials” are those quick, easy to grab bundle of flowers that are at your local market or florist. I use them a lot. Just ask my better half. OK back to the review. We have warmed to 65 degrees now so let’s see how she is holding up. The head has completely diminished to just a patchy island floating around the top of the glass. Hmmm, in some respects it is a little harsher and in other respects it’s a little smoother. The middle of the sip is much smoother with an almost creamy mouthfeel. I assume that is from the lack of carbonation. The back-end is pretty much the same but the finish is a little harsher. The hops and alcohol seem to be more predominate at this warmer temperature. This is still a very enjoyable barleywine, even at this temperature. The final sips were at 68 degrees and still quite exceptionable. This is a very good barleywine. My only dilemma is that I have not reviewed too many barleywines and I do not have a gold standard to compare this to. I will have to make it a point to drink more Barleywines next season (winter). So as it stands this is a solid B+ for me. This has everything that I like in a barleywine. A good warming alcohol presence, a nice balance of rich malts and bitter hops, and of course that classic barleywine finish (that I need to do more homework on). If you are interested in tasting a barleywine I highly recommend this one. It is a big beer but it is also nicely balanced. This is very similar to an imperial/double IPA but a little less intense with a much dryer and distinctive finish.